The 10th annual SYC Battle of the Buildings 2018, which raised in total $10,319. The Southern York County School District Foundation anticipates giving 172 scholarships totaling about $129,000 to Susquehannock High School’s 2019 graduating class. The application period is open through Feb. 11. The Foundation is an affiliated chapter of Scholarship America “Dollars for Scholars. Created in 1997, the SYCSD Foundation is more than a scholarship organization for graduating seniors, it is a multi-faceted charitable organization that provides giving opportunities for scholarships, projects, equipment, supplies, and other purposes that benefit all SYC students. The Foundation actively seeks grants and gifts for specific school projects, like purchasing technology for the district’s three elementary schools. For the 2017-2018 school year, raised nearly $245,000 in contributions (close to $1 million in the past five years), awarding over $119,000 in 161 scholarship to 110 2018 graduates, $31,000 for Classrooms Without Walls (technology program) and more than $3,200 for seven SYCSD Innovative Grants. Bruce Bauman, School Board Director and Treasurer, and Foundation board member shared news at the January 2019 school board meeting that the Foundation approved the recipients of this year’s Innovative Grants, a total of $4,383.29 in grants will be provided to: ELA Live, Embedding Building and Coding into 21st Century Learning, Friendship Butterfly Garden in Memory of Zachary Myers, Hummingbird Robotics, Drone Challenge, Robotics and Coding, The Adventure Club, The Sensory Path, Resources for CNC Machines, and Yoga for Health, Wellness, and Mental Endurance. 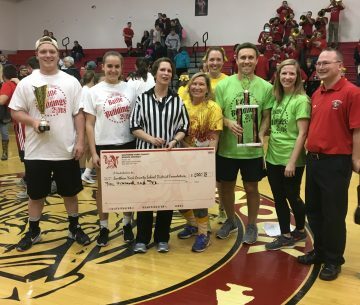 Among the Foundation’s signature annual fundraising events is Battle of the Buildings, now in its 11th year, on Feb. 27 at 6:30 p.m., Susquehannock High School. Last year more than 1,000 students, parents, staff, and community members cheered on their favorite school building teams and raised $10,319. Thanks to strong community partnerships and donor support, the SYCSD Foundation champions the district’s commitment to “make a difference in the lives of students, one Warrior at a time” by creatively and collaboratively advocating for our students and teachers for the resources and opportunities they need to be the best they can be.